Wow, what an amazing dinner we had last night. We have a tradition with a group of friends of getting together to watch Formula 1 races and having dinner. We don't always make it happen (we have been known to order pizza), but most of the time we try to have the food for the dinner be at least somewhat related to the cuisine of the country where the race is being held. We've had some really delicious and creative meals representing the various countries, and I've discovered some of my favorite recipes in searching for traditional things from some of these countries. Last night was the Spanish Grand Prix, and so we decided to do an evening of Tapas. We've done this before and have mostly just picked up some appetizer and finger food type things at Trader Joes and called it Tapas. But yesterday I decided to do a little recipe searching and see if I could come up with a few easy and quick, but actually Spanish style, recipes. And I found a few winners. I made four dishes - all so easy that I had them all done in about 45 minutes while at the same time making some mac & cheese for my kids and watching them eat. 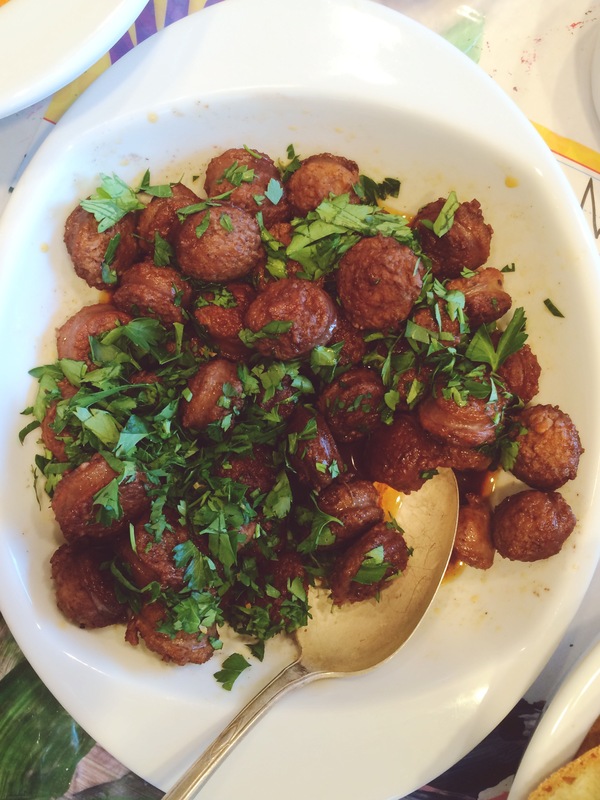 I found recipes for Chorizo in Red Wine, Garlicky Shrimp, and Romesco sauce/dip. And I made up one of my own, that I think might be a new favorite. 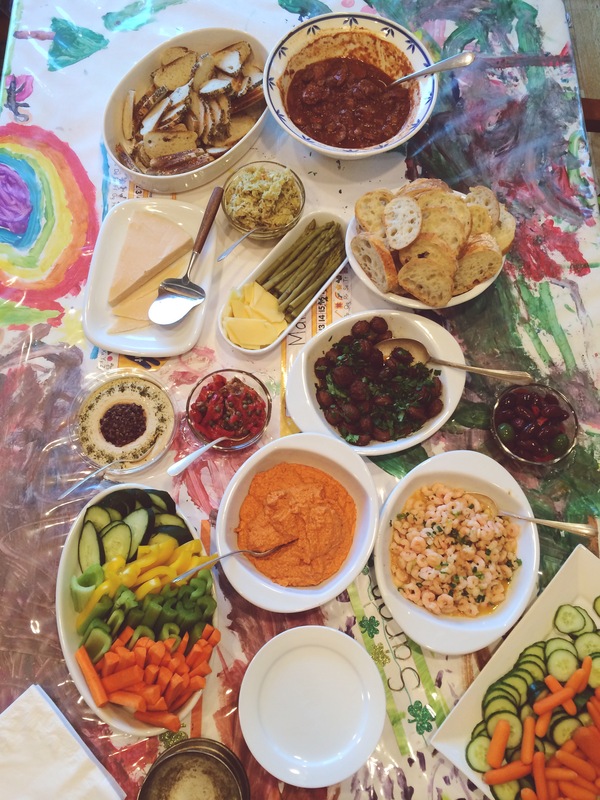 Here is our amazing spread on the table - I did some cut up veggies to have with the Romesco dip, and some cheese and olives, friends also brought some bread, cheeses, another chorizo dish and several more dips. This is my favorite kind of meal - lots of little tastes of things. My super simple but amazing Tapas creation. I don't know if something like this actually exists in Spanish food, but the combination of flavors sounded really good to me so I put it together. 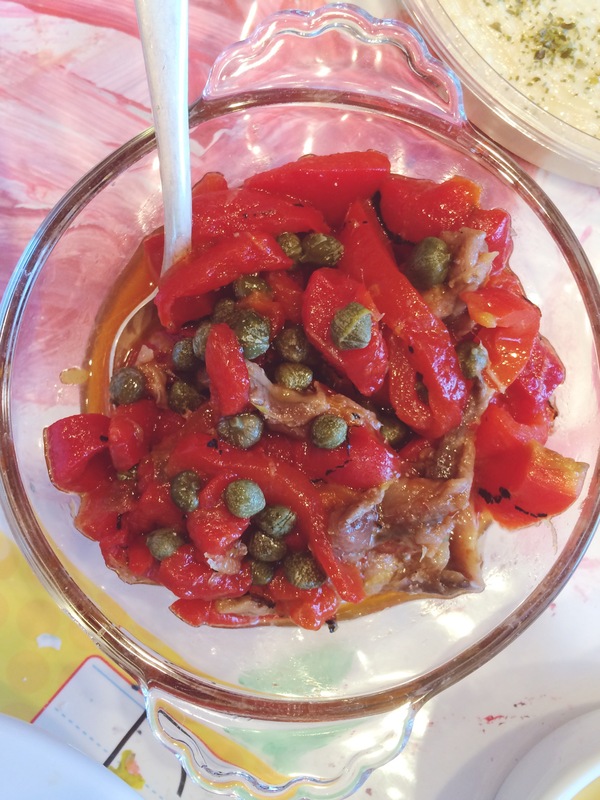 This is a small jar of anchovies (2 ounces, drained), a few ounces of jarred roasted red peppers (I bought a 16 ounce jar for the romesco recipe, and used probably a half a cup of them here - sliced), a tablespoon or so of capers, and zest from most of 1 lemon. Stirred together gently with a fork, to separate the anchovies without breaking them down too much, and then let it sit for an hour or so. It was amazing. Great on slices of baguette for those that were eating bread. I just ate it with a fork. I could have eaten the whole bowl. This is the Chorizo in Red Wine. I followed the recipe, such as it is, although probably a little more red wine. This is literally just sliced chorizo, cooked until nicely browned, and some red wine added to reduce at the end. And I added some chopped fresh flat leaf parsley on top for serving. 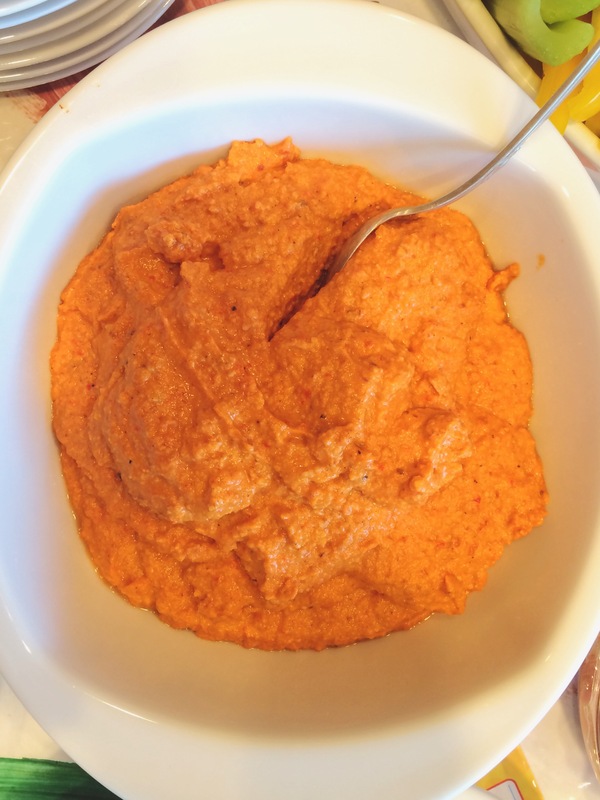 Romesco Sauce. I think this is going to be a summertime staple. So easy, and such amazing flavors - tomato, garlic, almonds all browned a little, and blended with roasted red peppers, vinegar, olive oil, salt and paprika. I probably made about 1 1/2 times the recipe amount - I didn't really measure. I used white wine vinegar instead of red wine vinegar, because that's what I had, and probably more olive oil than called for (it seemed a little too thick at first). I used 1 piece of bread (actually it was half a bagel) and I think next time I might try leaving out the bread altogether to just see if I can get away with it. And I also added the juice from a half a lemon, just because it sounded good, I like dips with a little acidity and brightness. We had it with sliced baguettes or veggies to dip in. I think it would me amazing on a sandwich or in a wrap, or on top of a piece of grilled chicken or fish. I'm going to be experimenting with this one. I feel like I've been in the dark - how can I not have know about this already? Garlicky Shrimp. So easy! 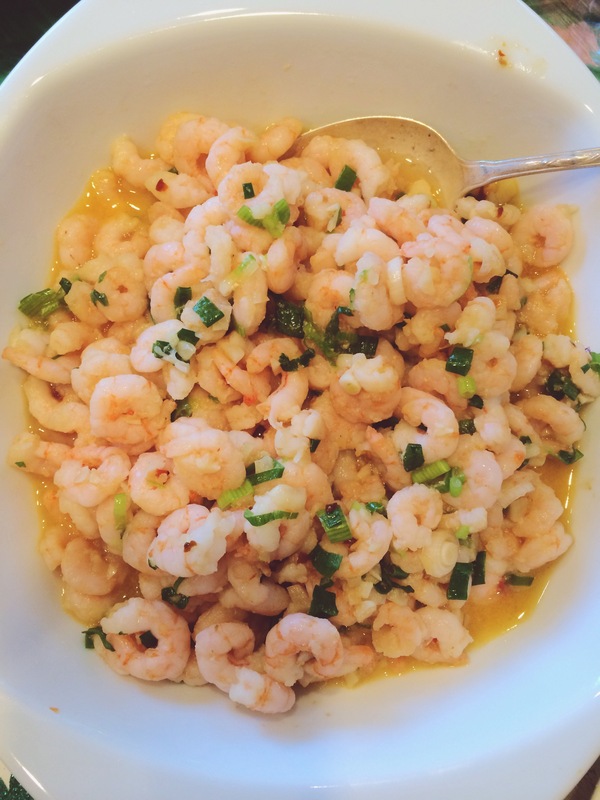 Butter and olive oil, saute some diced garlic and crushed red pepper in it, then remove from heat and add cooked shrimp, salt and sliced scallions. The flavor was amazing. It's butter and garlic, so of course. Everything was served room temperature, it was a warmish evening so that seemed just right. In the winter I might have wanted things hotter but for this time of year room temp seems perfect. We loaded up our plates and ate, and ate, and ate. There wasn't much leftover. I love it when I find things that are so simple and easy, and yet taste so amazing.